Radio Spirits » Blog Archive » Happy Birthday, Maurice Tarplin! Posted on April 1, 2019, 8:00 am, by Ivan G. Shreve, Jr., under Birthday, Classic television, Radio adventure, Radio crime, Radio drama, Radio horror, Radio mystery, Radio sci-fi. A 1946 issue of Radio Mirror noted that “practically everyone connected with the Boston Blackie show is a former athlete.” Radio Mirror was not publishing “fake news”: the show’s star, Richard Kollmar, was a member of the tennis team while attending Tusculum College (Tennessee) and later, at Yale, became an outstanding water polo player. (I’ll spare you the old joke about the horses.) Kollmar’s female co-star, Lesley Woods (who played girlfriend Mary Wesley), was captain of the women’s basketball team during her matriculation at Northwestern. The third member of the Blackie triumvirate—actor Maurice Tarplin (Blackie’s nemesis Inspector Farraday), born in Boston on this date in 1911—attended William and Mary, where he showed his stuff on skates as a member of that institution’s championship ice hockey squad. Maurice Tarplin was not only a William and Mary alum—he attended both Phillips Exeter and Harvard during his pursuit of higher education. As for a post-graduate career, Maurice decided an actor’s life was for him and he found that his memorably sardonic voice lent itself beautifully to the new medium of radio. He arrived in New York in 1937 and became a working thespian in the world of daytime dramas. He appeared on Myrt and Marge (as Barnie Belzer), Valiant Lady (Barclay), The Guiding Light (Richard Hanley), and When a Girl Marries. Tarplin would eventually become a member of the stock company on The March of Time, where his impersonation of Winston Churchill was always in high demand. Supplementing his gigs on the aforementioned shows were appearances on The Shadow, Ideas That Came True, Gang Busters, and The Columbia Workshop. 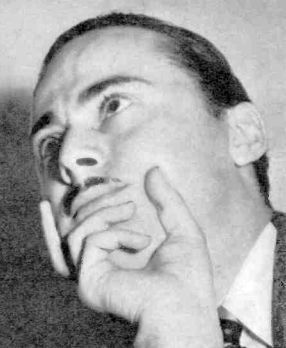 One of Maurice Tarplin’s high-profile radio jobs was playing Agatha Christie’s sleuthing creation Hercule Poirot on Murder Clinic, a show heard briefly over Mutual in 1942. Tarplin also starred (and announced) on Manhunt, a syndicated crime anthology in which Maurice’s homicide detective Bill Monroe assisted the investigations of forensic cop Andrew “Drew” Stevens. 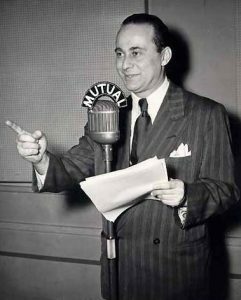 Manhunt was a quarter-hour production from the Ziv people, who put Maurice to work (as Farraday) when they resurrected Boston Blackie as a Mutual (and ABC) offering that ran from April 1, 1945 to October 25, 1950. 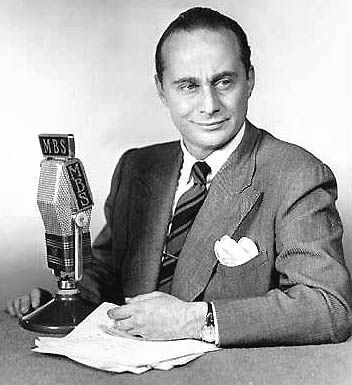 Other radio programs on which Maurice Tarplin made the rounds include The Adventures of the Abbotts, By the People, Casey, Crime Photographer, The Cavalcade of America, The Chase, Cloak and Dagger, Counterspy, Did Justice Triumph?, Easy Money, Echoes of a Century, Eye Witness News, Famous Jury Trials, Hallmark Playhouse, High Adventure, Hollywood’s Open House, Mr. and Mrs. North, Murder by Experts, The New Adventures of Sherlock Holmes, New World A’Comin’, Nick Carter, Master Detective, Now Hear This, Out of the Thunder, The Sealed Book, Secret Missions, We Came This Way, What’s the Good Word?, Worlds at War, and You are There/CBS is There. Tarplin also had the distinction of appearing on the radio versions of two early TV favorites, Tales of Tomorrow and Tom Corbett, Space Cadet—both rare examples of programs that made a TV-to-radio transition. Maurice Tarplin was first and foremost a radio actor. 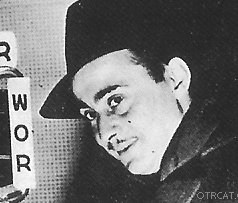 He made the occasional appearance on shows like Danger and Naked City, but he went the distance where radio’s last hour was concerned—working on shows like X-Minus One, Exploring Tomorrow, Indictment, Suspense, and Yours Truly, Johnny Dollar. Even after “the Golden Age of Radio” had come to an end, Tarplin could be heard on such series as The Eternal Light and Theatre Five. Maurice was a man of many interests: he penned a short story, Seven Casks of Death, which was published in a 1948 issue of Dime Mystery Magazine. Until his passing at the age of 64 in 1975, Tarplin kept busy doing voiceovers on television commercials and providing translations on the English soundtracks for foreign films. 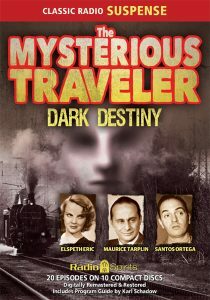 Radio Spirits is pleased to offer a fine collection of broadcasts featuring today’s birthday celebrant in his signature role as The Mysterious Traveler. 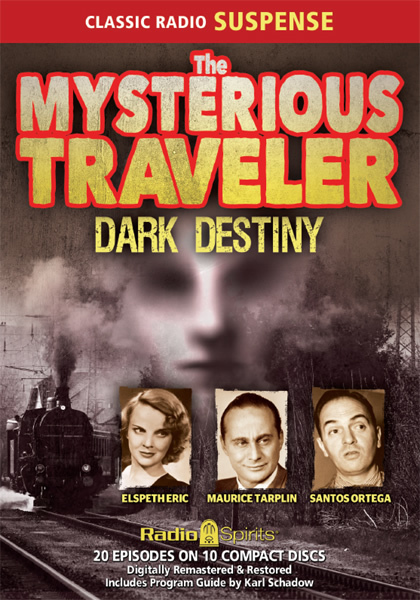 Not only can you listen to Maurice Tarplin on Dark Destiny, but you can enjoy his exploits in two Traveler episodes featured among the many on our Great Radio Horror compilation. Maurice plays Inspector Farraday on our Boston Blackie sets Boston Blackie Delivers the Goods (and he does!) and Death Wish, and gives it his all on the Yours Truly, Johnny Dollar compendiums Medium Rare Matters and Mysterious Matters. We hope you saved room for the “ice cream and cake”: Tarplin’s showcases on Casey, Crime Photographer: Blue Note, The Sealed Book: Ghostmakers, The Shadow: The Story of the Shadow, Suspense: Final Curtain, Words at War, and X-Minus One: Far Horizons. Happy birthday, Maurice! Thanks to Mr. Shreve for honoring my father Maurice Tarplin with this excellent biography. I would be very interested in learning whether you have collected any other materials documenting his career. Jeffrey, I won’t lie to you: I found it a challenge gathering up much of this information on your father (I found a tidbit here and there in some of the radio fan magazines from the past). I’m sure you have a story or two to tell yourself! That novel mentioned above is actually a short story from the June 1948 issue of Dime Mystery Magazine. Contact me via bluecar91 at hotmail.com for a scan of this item. Moreover, Maurice Tarplin was purported to have been cast in The Scoundrel (Paramount, 1935). Does anyone have this film? Karl, I should have thanked you for the correction here instead of my e-mail — I have papered over my initial mistake with your most helpful information! This is great! So much I did not know about the Tarplin patriarch. The second photo (the upshot) is a dead ringer for a younger Jeffrey Tarplin. I’m sure my parents must have enjoyed Maurice at work in their younger days. 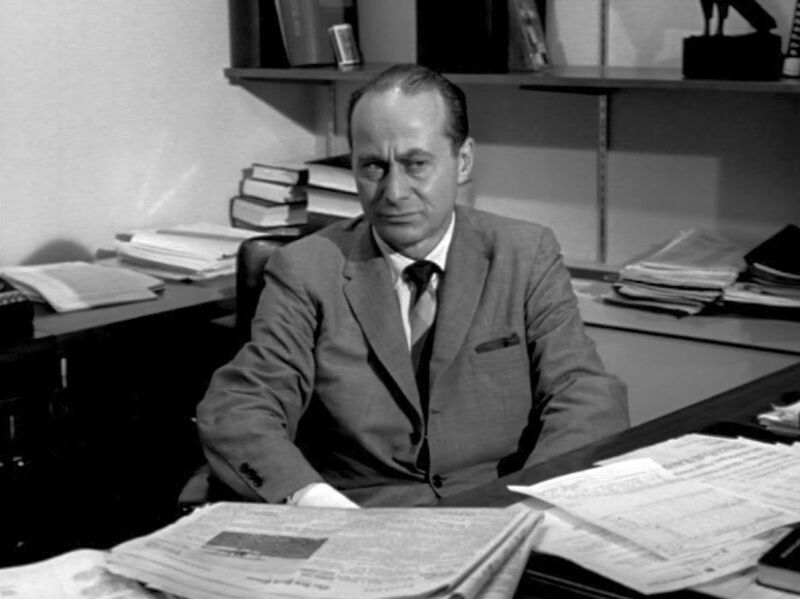 « Happy Birthday, Earle Ross!